As HARBORcenter continues to grow, the encroachment upon the front door of First Niagara Center is becoming more and more apparent. One of the most significantly altered spaces of the 18-year old arena will be the pavilion. The grand entrance atrium was a hallmark of the design of the arena when it was originally introduced as Crossroads Arena. Having a main front door and entryway to an arena was a design feature that wasn’t regularly utilized in pro sports. It made the new home of the Sabres unique from many of its NHL counterparts. Now, with the skybridge connecting HARBORcenter and First Niagara Center, the look and functionality of the atrium will be significantly altered. Based on the renderings and seeing how the façade of the arena will be affected by HARBORcenter, the original design and look of the atrium will be almost entirely compromised. 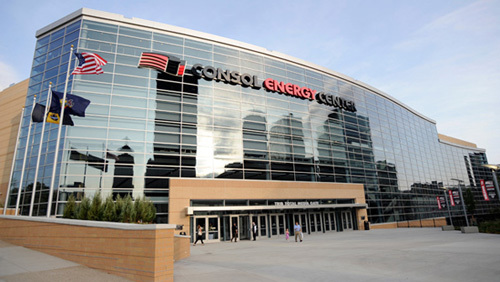 While it would certainly be costly, there is now an opportunity change the outward appearance of the arena’s front door while also improving the design aesthetic of the arena so it fits better with its new neighbor. The way that HARBORcenter and First Niagara Center come together has a somewhat awkward look when you look at the height and design of the pavilion and how the skybridge works into it. Additionally, the height of HARBORcenter’s rinks serves to affect the look of the pavilion. Why not alter the façade of the pavilion in order to allow for the two buildings to join together in a less awkward manner? By extending a redesign onto the other side of the pavilion to extend down to the Alumni Plaza, the front of the arena would not only get a visual upgrade but would also create a uniform look with HARBORcenter. A simple glass façade would not only be the easiest but would also provide a nice visual upgrade. However, the lower levels of HARBORcenter, particularly the skybridge is brick which would likely clash with an all-glass look for the arena. Still, by making the new façade primarily glass would allow the pavilion to transform from the simple, somewhat marine inspired design it has now, to a dynamic, sweeping glass front which would share some similarities to the beautiful front door at CONSOL Energy Center or even Prudential Center. Imagine looking at First Niagara Center from the corner of Illinois and Perry to see a curved glass façade working from the bridge connecting the arena and parking garage and around towards the HARBORcenter skybridge. On the other side, the façade could be a combination of glass and brick in order to establish a solid visual transition between the arena and HARBORcenter. I’d envision the pavilion gaining some height to better meet the eight-story roof of the adjacent rinks and to provide a great presence now that a massive mixed-use facility will be stealing much of First Niagara Center’s curb appeal. This height could be strictly visual and not fully functional if necessary. Ideally it would allow for more open glass on the roof in order to provide more natural light to the entire space. Adding height – artificial or functional – on the end where the Sabres store resides and gradually decreasing it back to the current height as the space approaches the ticket office and plaza would provide the necessary alteration where the impact of HARBORcenter is greatest while having a smaller impact in an area that doesn’t require as much change. It would likely take on something like a wave effect due to the decrease in size from one end to the other. One other change I’d make would be to enclose the patio that sits on the corner of Perry and Main (technically the corner of One Seymour Knox III Plaza). Outside of recent press conferences, I’m not sure I’ve ever seen anyone on it during an event. Why not extend the pavilion’s exterior to wrap around that corner? It could serve as an extension to the Lexus Club, the second floor of the pavilion or even as a brand new space directly above the Sabres Store. Either way, half of that patio will now have an obstructed view due to HARBORcenter. Enclosing it and making it part of the arena’s interior would at least allow the space to be functional as opposed to useless. The biggest hurdle will be finding a way to design any change to the pavilion so that it works in unison with HARBORcenter. The combined glass and brick façade of HARBORcenter won’t allow for a strictly glass addition to be made to First Niagara Center’s atrium. Perhaps that means no change could be made, but it would certainly serve as a phenomenal visual upgrade that could compliment the brand new tower going up across the street.